As an outdoor enthusiast, you invest time and money in Georgia's natural resources. 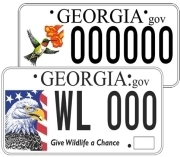 Buying hunting and fishing licenses and equipment, including a Georgia Outdoor Recreation Pass, makes it possible for Georgia DNR to manage public hunting and fishing areas -- which are also open to birding and other activities -- conduct research, plant food plots, raise and stock millions of fish, and more. There is a demand and desire from citizens for the DNR to do even more. However, stagnant license revenues limit the agency's short- and long-term ability to respond. What are some options? Further expanding efforts to recruit, retain and reactivate hunters, anglers and others in the sporting public; simplifying the license structure system to maximize funding from federal Wildlife and Sport Fish Restoration programs; and, adjusting license costs (resident license fees have not changed in 23 years and rank well below the national average). Seven public forums have been scheduled to begin gauging interest in these options. Also, more details and a survey are posted at www.georgiawildlife.com/aimforsuccess. The wait was nearing five hours. Senior wildlife biologist Nathan Klaus considered leaving his stakeout at Tallulah Gorge State Park. Again. A long drive to an out-of-state conference awaited him. Then Klaus glimpsed a crow-sized bird zip toward the rock wall that Assistant Park Manager Jessica James had pointed out, the place where rock climbers said they’d been dive-bombed by a raptor of some sort. Klaus peered through his spotting scope. Yes! The bird was an adult peregrine falcon. It landed on a ledge. And as if materializing out of gray rock and brown-green brush, two fluffy nestlings appeared. Georgia’s first peregrine nest in a natural setting in nearly 80 years had been confirmed. “They were hiding in plain sight,” said Klaus, who works with DNR's Nongame Conservation Section. Tatum also thanked climbers for reporting the falcons and understanding the importance of protecting the area until the young fledge. Georgia’s last known eyrie on cliff ledges was in 1936 at Cloudland Canyon. The only other peregrine nests in the state are on buildings in Atlanta, including one that DNR live-streams. While the nesting range of the world’s fastest flying birds never extended deep into north Georgia, peregrines were almost extirpated from the eastern U.S. by the 1960s, largely because of impacts from DDT and other chemicals. 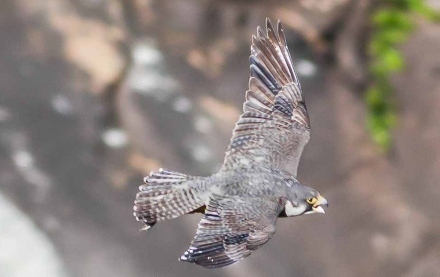 The effort behind the species’ rebound included hacking falcons in the late 1980s and early 1990s in north Georgia, including at Tallulah Gorge. Going to the gorge? Bring binoculars and check at the Interpretive Center for directions and tips. Views are from overlooks 8, 9 and 10. A loggerhead sea turtle laid her species’ first nest of the season on Cumberland Island the night of May 3. 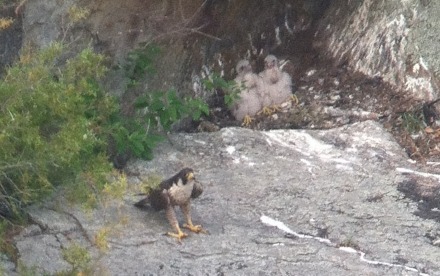 Cumberland also had the first nest last year. Biologists expect a productive summer for loggerhead nesting (the count is already over 80). The peregrine falcons nesting on Atlanta’s SunTrust Plaza Tower had four eggs, not three as first thought. Nongame Program Manager Jim Ozier banded the four eyases May 11 (video). 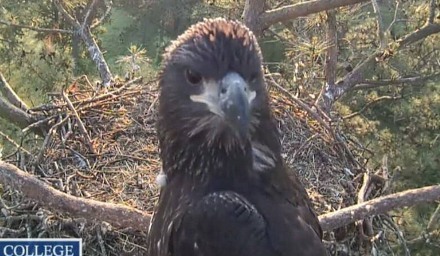 Watch the family grow on DNR’s nest cam (and join the conversation on Ustream). The two young bald eagles at the Berry College nest have fledged. Follow some of the world’s best-known eagles on Berry’s website and DNR’s! Meanwhile, The Landings great horned owl cam is off-line, but the owlets that fledged there in March seem seem to be doing fine. A common axiom is that if you want plenty of wildlife in your yard, you need to provide food, water and cover. But the truth is you can provide those elements and still not attract as much wildlife as you should. When this happens, the culprit may be the improper use of pesticides. The U.S. Environmental Protection Agency estimates that we Americans douse our lawns with some 80 million pounds of pesticides a year – and at a rate 10 times higher than what the nation’s farmers apply to their crops, according to the U.S. Fish and Wildlife Service. Most pesticides kill a wide variety of insects. That means pesticides sprayed on your prize roses might wipe out rose pests, plus untold numbers of beneficial insects living nearby. Pesticides also often end up far beyond the place they’re applied. Chemicals sprayed on a windy day can drift into your neighbor's yard. Rain runoff can flush chemicals into a nearby stream or lake. And keep in mind: Most of the wildlife in your yard, from toads to nesting birds, depend on insects sometime during their lifetime. Read Terry’s full column for more on pesticides, their impact and what you can do to control the use. For bats that either aren’t susceptible to white-nose syndrome or were spared the disease this winter, late spring is an important time of year. It’s pup season! Most of Georgia’s bats give birth to one pup during May or June, and pups are unable to fly until July or August. Until then, they are completely dependent on their mothers. If you have bats in your belfry – or your attic, barn or other structure – and need to exclude them, wait until after Aug. 15, if possible. This gives the pups a chance to learn to fly and leave with their mothers when excluded. If bats are getting into your living space or large numbers are causing excessive guano buildup, you may not be able to wait. Any bat exclusions in Georgia between May 1 and Aug. 15 must be done by a licensed nuisance wildlife company. If there are young bats, they must be removed safely. Outside of the pup season, most bat problems can be handled by the homeowner. For more information on how to safely and humanely remove bats from a structure, visit Bat Conservation International. Remember to use caution when dealing with wildlife. Never touch bats with your bare hands. Wear gloves when removing bats. And if at all possible, avoid handling them – it’s easy to harm the small bat species we have in Georgia. Also, although very few bats (about a half of 1 percent) have rabies, if bitten by a bat, immediately consult a doctor. Why care about bats? They are an important part of our natural resources. All of Georgia’s bats eat insects, and some bats eat their weight in insects each night. It’s estimated that bats save U.S. farmers up to $23 billion a year by helping control crop pests and reducing the amount of pesticides used. Wildlife biologist Trina Morris leads bat research for DNR’s Nongame Conservation Section. Install a bat box: Bat Conservation International has guidelines for building and installing bat houses. You also can buy one made in Georgia. Habitat for Bats sells houses and kits. Just be sure your bat house gets lots of sun and is installed at least 10 feet off the ground. 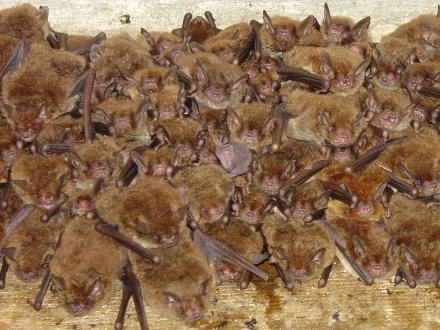 Join DNR’s roost count: DNR is looking for volunteers with bats in bat houses, barns and other roosts to count their bats twice each summer. A roost is a place where bats concentrate, possibly to form a maternity colony, and return to regularly. DNR's website explains the project and includes data sheets, instructions and a bat ID guide. Make space for bats in your yard. Then grab a seat at sunset to watch the show, and fill out a data sheet so your bats will be counted! The 10th annual Youth Birding Competition posted big numbers: 26 teams, 92 participants and an event record 167 species seen or heard by overall winner The Florida Scrub-jays, two teens from Gainesville, Fla. The event’s reach is broadening in Georgia, the Scrub-jays were one of 13 first-time teams, and nationally, with Race4Birds helping organize contests in seven other states. Red-cockaded woodpeckers at Silver Lake Wildlife Management Area near Bainbridge are going -- and growing -- strong. Biologists are monitoring more than 20 nests and have banded 25 nestlings (left). 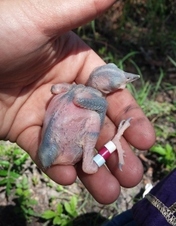 These endangered birds are banded about eight days after they hatch. The latest “Landowner’s Guide to Conservation Incentives in Georgia” is available at www.georgiawildlife.com. Updated by the Nongame Conservation Section’s Steve Raper, the guide is a one-stop source of financial and technical resources for Georgians interested in conservation on their lands. Shorebird conservation and management were the focus of a recent Manomet Center for Conservation Sciences workshop at Tom Yawkey Wildlife Center Heritage Preserve in South Carolina. 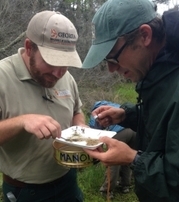 At left, DNR participants Robert Horan and Tim Keyes sieve mud to see what shorebirds have been eating. Georgia’s Marine Mammal Stranding Network rescued an apparently healthy, pregnant bottlenose dolphin that became stranded at low tide on a sand flat at St. Catherines Island May 13. A team from the St. Catherines Island Foundation, Georgia Sea Turtle Center and Georgia Southern University evaluated, tagged and released the dolphin unharmed. Follow Charlie Elliott Wildlife Center on Facebook for updates on camps and programs, including which summer camps still have room for sign-ups! And learn about all DNR's seven regional education centers at www.georgiawildlife.com/education. 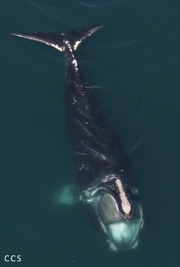 Here’s what North Atlantic right whale 4057 looks like gear-free. As announced in the previous Georgia Wild, when the Center for Coastal Studies spotted 4057 in Cape Cod Bay last month, the whale had shed the fishing rope that remained after wildlife biologists cut away most of it in February 2014. The downside: Despite responders’ best efforts, many of these imperiled whales die of entanglement in commercial fishing gear, highlighting the need for better fishery management and prevention, writes Clay George, lead right whale researcher for the DNR. An AmeriCorps team helped the Coastal Georgia Cooperative Invasive Species Management Area tackle projects varying from removing invasive water hyacinth on the Altamaha River and sand pine on Townsend Wildlife Management Area to treating Chinese tallow on Sapelo Island. The Coastal Georgia CISMA is an alliance of government agencies, nonprofits and volunteer groups covering 11 coast-area counties. Friends of Sapelo celebrated its 20th anniversary on April 25. The event drew about 140 current and former members of the group. Photos. 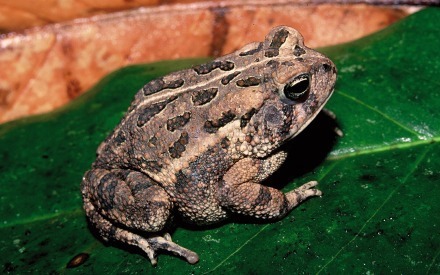 DNR’s tortoise survey crew found the two gopher frogs and the gopher tortoise above in a tortoise burrow at Okefenokee National Wildlife Refuge in southeast Georgia. 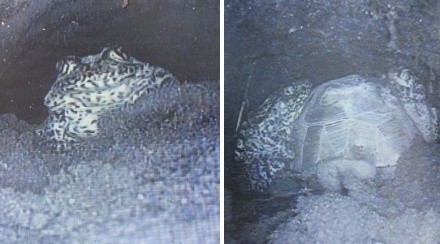 The photos were taken with a burrow camera. Names in the news: The Race4Birds foundation, created to spread the Youth Birding Competition concept to other states, has created an award in honor of DNR’s Tim Keyes, who started the competition. Race4Birds President Constance Campanella announced at this year’s event banquet that the Tim Keyes Visionary Award would be given to youth birding leaders who exhibit “extreme leadership, vision and dedication.” Atlanta Magazine named DNR senior wildlife biologist Mark Dodd, coordinator of Georgia's Sea Turtle Program, and Little Saint Simons naturalist manager Stacia Hendricks, a board member of The Environmental Resource Network, as two of the publication’s “55 secrets of the Georgia coast.” At TERN’s annual meeting May 16, the friends group of the Nongame Conservation Section honored Brock Hutchins for his six years as TERN president. 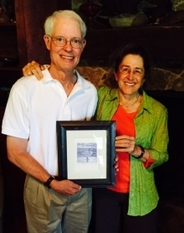 Hendricks (pictured with Hutchins), as chair of the nominating committee, presented Hutchins artwork by Georgia naturalist and artist Lydia Thompson. In the May-June issue of Georgia Forestry Today, DNR wildlife biologist Trina Morris explores what the federal listing of northern long-eared bats and an interim 4(d) rule means for forest management in north Georgia. Recently promoted Capt. Jeff Galloway will supervise the DNR Law Enforcement Division’s Region I, which includes Atlanta and 20 counties in northwest Georgia. Bird banding times, dates: Panola Mountain State Park, Stockbridge – May 23, 5:30 a.m. Joe Kurz WMA, Woodbury – May 24, 5:30 a.m.; May 30, 5:30 a.m. Updates, including schedule changes: Charlie Muise, Georgia Important Bird Areas Program. May 30: Endangered Species Day, 10 a.m.-2 p.m., Atlanta Botanical Garden. June 3-4: First Detector Workshop, Georgia Exotic Pest Plant Council, Reed Bingham State Park, Adel. June 5: 20th anniversary celebration of the Georgia Plant Conservation Alliance, 5 p.m., State Botanical Garden of Georgia, Athens. June 6-14: National Fishing and Boating Week, featuring two free fishing days (June 6 and 13) and many kids fishing events. •	Bald eagles big year. •	Another bad winter for Georgia bats. Coming soon to a computer near you: a Sci Fries’ YouTube video on fire and sandhill habitats. The group of Swainsboro Middle School students makes educational, and fun, movies on scientific topics, such as Ohoopee Dunes Wildlife Management Area. 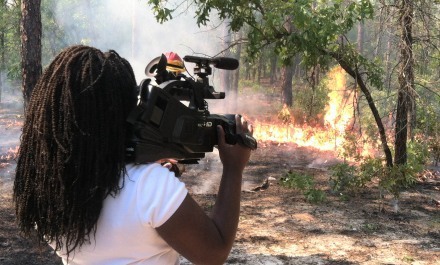 Sci Fries members recently videoed DNR and partners conducting a prescribed burn at the WMA near Swainsboro. Sources for the documentary included DNR fire management officer Shan Cammack and Game Management Section biologist John Thrift, formerly an instructor at Southeastern Technical College. Stay tuned!